Tesla‘s annual meeting is set to kick of at 5:30 pm ET in California on Tuesday. The stock is down 2.5% ahead of the meeting. Shares of Tesla slid as much as 2.5% Tuesday as investors arrive for the electric-car maker’s annual meeting in California, which kicks off after markets close. The stock has had a rough start to 2018, down 7%, as worries of the company’s need for cash swirl around Wall Street. That cash burn, alongside concerns about the company’s ongoing struggle to meet its own Model 3 production goals, are sure to be at the top of shareholders’ minds. Among the proposals to be considered by investors will be the re-election of three Tesla board members, including CEO Elon Musk’s brother, Kimball, who have seen opposition in recent months. 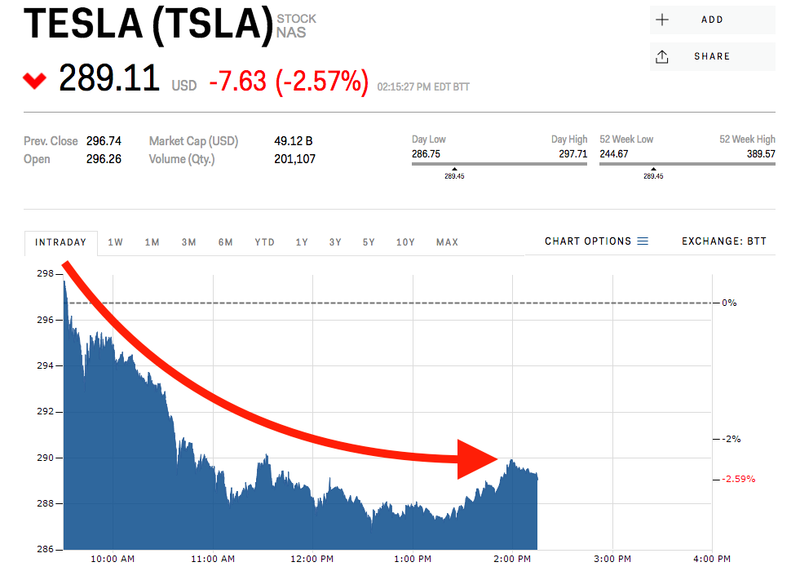 Tesla’s slide, down 10% since the beginning of the year, is sure to be music to the ears of short-sellers, who currently have more than $11 billion riding against the stock, according to data compiled by financial-analytics provider S3 Partners. Here are some of the major stories Tesla investors are likely to be discussing when the meeting kicks off at 5:30 pm Pacific Time. You can stream the full event here.